Hey friends! Ash and I are SO pumped to share our very first YouTube video tutorial with you guys today! When choosing which project to tackle on video first, we found it fitting to start with our most popular build…. The floating shelf. We have built a ton of these bad boys, in different sizes and materials. Today’s floating shelf we built are super inexpensive and easy to create. First, check out our Floating Shelf Video! Just click the play button below! CLICK HERE FOR FREE PRINTABLE PLANS! First step…. Make your cuts. We used a miter saw to make our cuts. The hardwood plywood comes in bigger sheets at the hardware store. You can have the guys there cut it down for you to make it easier to get home. Here are the cuts for 1 floating shelf. 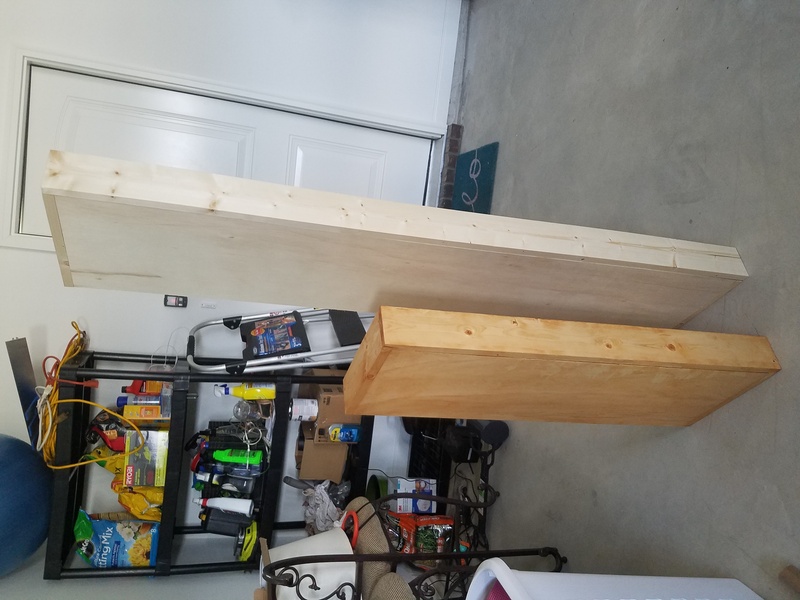 Second step…Build your box. This shelf uses hardwood plywood and 1×6 to create the box. For this box, we used wood glue and 1.25″ finish nails to attach all of our pieces. Build the 4 sides first, and then glue and nail the top piece to that. We finished our box and stained it. While it was drying we built the wall cleat. This is made from a 2×4. We made our cuts and then used our Kreg Jig to create 1.5″ pocket holes into each of the 3 smaller pieces. We attached each of those three pieces to the longer 2×4 using wood glue and 2.5″ pocket hole screws. Our final step is fitting the shelf over the support. The box just slides over the wall support. We used 1.5″ screws through the top of the box and into the support to hold it in place. Finished! These hold just about anything… I found the arrow bookends at Pottery Barn, but they no longer carry them BUT I found almost an exact match (and cheaper) on Amazon HERE! Hope we made that easy for you! Be sure to check out the video tutorial HERE on YouTube and subscribe to our channel so you don’t miss anything! We will be sharing new videos regularly! Let us know if you have any questions at all and HAPPY BUILDING! What is the thinkness if the plywood and what color is the stain? I love these shelves! I was just wondering what is the thickness of the plywood? 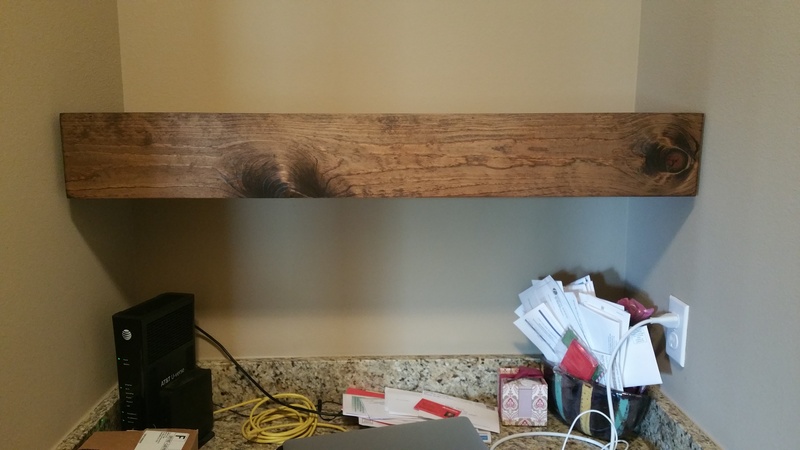 Why does this plan differ from another plan for floating shelves on your site? One of the other plans has me putting pocket holes into each board of the box. What color stain do you use? Hi. I may have overlooked it but were you able to get the name of the color stain? My girlfriend fell in love with these, she had me build her some at different sizes to off set them when they’re hung up. Your plans are simple and easy to follow. I know nothing about wood working but you guys inspired me to. Thank you, here is a WIP. She is still deciding if she wants 2 big ones or 2 small ones. Hi there!! I am in love with these! However I have been trying to figure out what color stain this is. Help! 🙂 I just built a console table and I would love for the stains to match. did this above our built in desk area for a little storage and decor for my wife. Thanks for your quick reply. I am thinking something different. I am not going to keep heavy item on this shelves and it is only 30 inch long. I will update once I thought about it. Please let me know what type of painting or varnish you have used? I notice some of your shelves have hardware for decor, how did you do that? Also, what is the stain color? Thanks. Hello I was just wondering what the thickness of the plywood you used? Im assuming they are 3/4″in think to match the 1×6 but I want to make some this weekend but I want to make sure before I buy the material. On your cut list there are only two pieces colored yellow for the cleat when there should be three. Just thought I would tell you–it threw me off for a minute, but then I figured it out. Great, great video!!! Just in case you want to do a little fix on your video, cleat is spelled with ea and not ee. Sorry to be so picky; I’m a spelling nut and I didn’t want you to be embarrassed. You can delete this comment if you want. I love your site/tuts/show. And I did not even know until this video that you two were SISTERS! That’s even cooler! what color stain did you use and I know your video doesn’t show it but is there any sanding involved? I wanted to know the same thing what stain and was there sanding? I want to make my pieces narrower not as thick as 5 and less depth..